In GATE's experience, there are many preconceptions based around the comparative costs of reactive versus proactive souring control strategies. One such area is the comparative operating expenditure (OPEX) associated with the use of either sulfate removal or nitrate injection as part of a proactive souring control program. Work undertaken to support the development of a recent paper published at the 2011 NACE Corrosion conference by GATE, LLC, and a number of our Clients, included a detailed assessment of the respective operating costs for nitrate injection and sulfate removal unit (SRU) deployment. Although the broader content of the paper considered the comparison of scale squeeze versus SRU use for scale control in deepwater projects, the issues raised by this aspect of the cost analysis are worthy of more detailed comment. Depending on the individual involved, there can be a perception that the chemical costs associated with nitrate injection far outweigh the OPEX costs associated with sulfate removal. Similarly, others may expect the need to clean and replace membranes and to monitor membrane system condition and performance as generating the higher OPEX. The cost estimates contained in Table 1 were generated for a generic 100,000 BWPD development in the Gulf of Mexico, as based on median costs provided by several different operators. 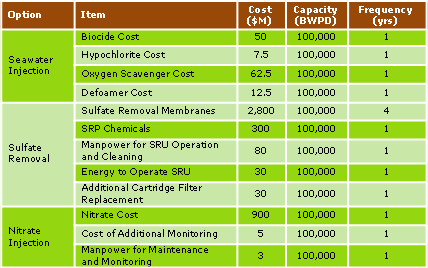 An area that stands out in Table 1 is the high cost of manpower and chemicals for the sulfate removal unit. These are a result of the need to regularly treat the membranes with biocide and high and low pH cleaning solutions to maximize their effective operating life. Sulfate removal membranes can be considered a consumable item that will need periodic replacement. It is possible that facilities with effective upstream filtration and efficient biological control and cleaning programs will see service lives substantially beyond 5 to 10 years, but systems impacted by heavy solids loading or less rigorous biocide or cleaning programs can experience a significantly lower membrane service life of 2 years or less. Sulfate removal systems discharge 25% of their incoming flow as high-salinity effluent. For SRU systems that are located downstream of the deaeration package, this means that 33% more water will need to be treated to remove oxygen. This arrangement also precludes the use of defoamer in the deaeration package because there is no defoamer product that is considered compatible with the membrane materials. These factors are both considered in Table 2, which shows a comparison between the OPEX costs associated with seawater injection, seawater injection with nitrate for souring control, and seawater injection with sulfate removal for scaling and/or souring control. Figure 2 provides a comparison of the cumulative OPEX associated with nitrate injection and sulfate removal beyond that due to seawater injection in the absence of any need for scaling or souring control. It is assumed that the initial membrane cost is included in the capital budget and that OPEX costs for membrane replacement consist of the replacement of 25% of membranes from year 3 onwards. Although there are many preconceptions within the industry regarding the respective operating costs of nitrate injection and sulfate removal, a comparative evaluation of cost data developed for several operators across several Gulf of Mexico developments indicates that there is likely to be no meaningful difference in OPEX requirements for a given project using the nitrate injection rates commonly applied to seawater injection and assuming a median 4-year membrane replacement cycle.